I was glued to my computer mid-day today, watching the men’s 100 meter Olympic semi-finals and then, two hours later, the final. The semi-final performances suggested this would be a four-man race, and so it was: Jamaica’s Usain Bolt and Yohan Blake, the US’s Justin Gatlin and Tyson Gay. Despite difficulties over the last two years, Bolt confirmed his greatness today by pulling ahead at about the 50-meter mark, steadily opening up a gap on the field, and winning in the second fastest 100 meter in history. Only his extraordinary world-record time at the 2009 World Championships was faster (though we’ll never know how fast he might have run the year before at the Beijing Olympics, where he set an earlier world record while slowing down at the finish). However, today’s race, great though it was, is not the point of this post. If you want to know more about it, you can read the coverage. 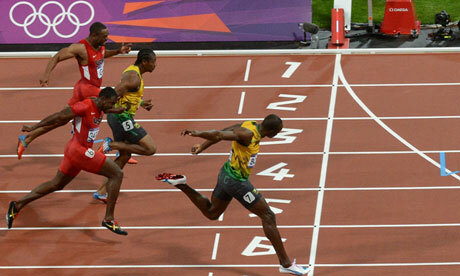 For instance, see Richard Williams’ piece at The Guardian, accompanied by the photo below, which shows Bolt crossing the finish line with Blake, Gatlin, and Gay behind. Instead, I want to draw your attention to a fabulous graphic at the NYT website. I can’t embed it, so you’ll need to go here. In fact, do so right now. Click on the link — here it is again — and watch the 2 3/4 minute video. 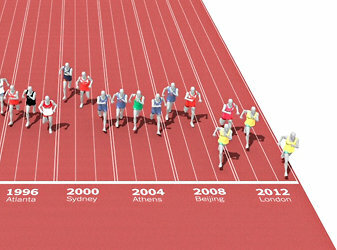 It puts Bolt’s performance in the context of the medalists’ times for all Olympic 100-meter races since 1896. I’ll admit, I’m not convinced that the information conveyed by the video is all that interesting. Times have gotten steadily better over the last 116 years. * If there’s a deeper message, it eluded me. But the graphics are brilliantly done, and that’s why I’m recommending that you have a look. *Then again, if one wants to find out about improvements in Olympic times, the 100 meter is the race to study. The competitors can’t mess around. They have to run their best, and generally they do. No room for tactics, such as those that occur in the 1500, 5000, or 10,000, with concomitant slow times. The 100 meter consistently produces record or near-record times, as it did today.